Tell us about yourself: I have 3 dutch shepherds, my female is Xena, male is Jazz and my newest addition my blue brindle Rush. I am a huge Dutchie fan. I was K9 handler in the USAF, in patrol and explosive detection. And now Odin Puppy!!! Laurie and my 3 beautiful Dutchie furry babies!! These are just a few pics I have of pups all grown up from previous litters, pictures sent to me from their owners. Ohh I wish I lived closer to you, your babies are beautiful! Hello, my name in Dan, I live in Southeasern WI. I would like more information on your Pups. I am intrested in a Brindle Male, this pup will be a family pet. Please let me know how we can get in touch. 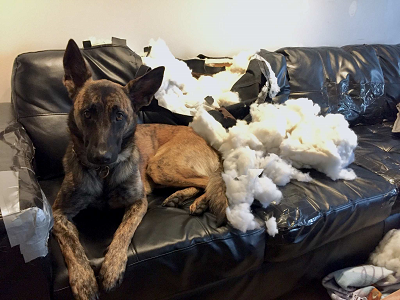 Tell us about yourself: Dog owner all my life, new to the dutch shepherd breed. And really appreciate these dogs! Ava is a Belgian/Dutch cross and she is an amazing animal! Hi There, My name is Ray. I'm in Benson AZ. I'm interested in a male pup, anyway to get one here to Arizona?